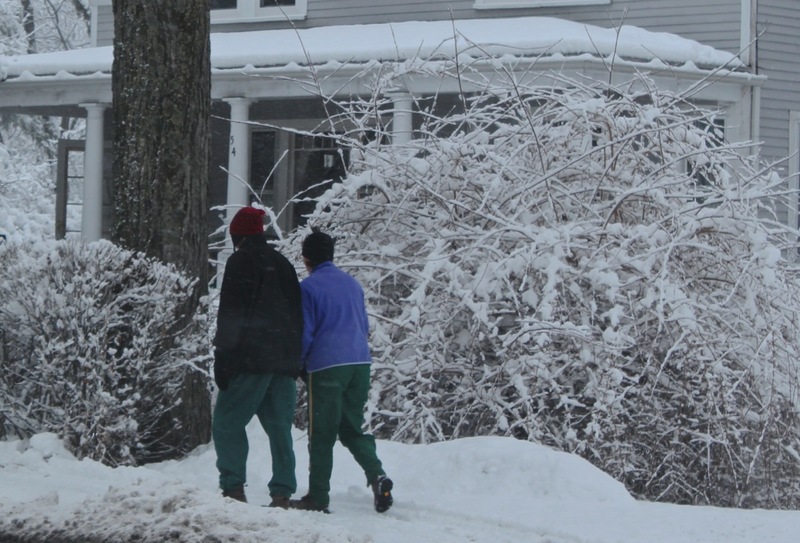 Frigid temperatures have plunged us back in an unwelcome deep freeze this week. Snow on the ground is frozen solid like a glacier, dangerous to walk on. Oh, but last week we were able to enjoy a perfect snow (in my opinion), a nice wet snowman building snow that created a flocked winter wonderland. No matter how tired we are of the white stuff, the view was breathtaking. Gray clouds that seemed to spread a bluish cast over the snow. That blue cast was actually due to the density and heaviness of the wet snow. Snow is colorless. Dry, fluffy snow contains more air bubbles to reflect light out, thus looking more white. The heavy, wet snows absorb more red light and the more red that is absorbed, the bluer the the snow. Walking through the neighborhood was like walking through a movie set where every branch, auto, and blade of grass has been sprayed with faux snow. And we weren’t the only ones out and about. We passed a steady stream of walkers, runners, and canines out for a slushy snow excursion. Every now and then, a request is made to use one of my photographs and I gladly comply…especially if they’re nice enough to credit me. Yesterday a digital lifetime magazine, ScoutieGirl, used one of my photos from a trip to the Netherlands a couple of years ago. From her article I learned something new: last weekend was National Tulip Day celebrated in Amsterdam, the official kickoff of tulip season that lasts from January until the end of April. Organized by growers, about 200,000 tulips are displayed in Dam Square in Amsterdam where visitors can browse the blooms and pick a free bouquet for their home. Last year, there were about 10,000 folks who happily tiptoed through the tulips picking their favorite colors. A youtube video of the 2013 Nationale Tulpenday gives us a peek into the joyful event. We were lucky enough to accompany Virginia bulb growers, Brent and Becky Heath, for a once in a lifetime adventure through public and private gardens and behind the scenes look at the operation and fields of several growers who are associated with the Heath’s business. Here are a sampling of my photos that give me a little hope that spring will eventually come to this frozen New Hampshire landscape. Since mister gardener is of German heritage and does almost all the cooking in this house, he routinely prepares meals with cabbage… just like he had growing up. The only time I ate cabbage growing up was a bit of coleslaw on pork barbeque sandwiches. It took me a while, but I’ve learned to like and appreciate the numerous ways it is presented at dinner. Besides, cabbage is good for you! Last night’s Winter Salad, a salad that may be familiar to many, was terrific. 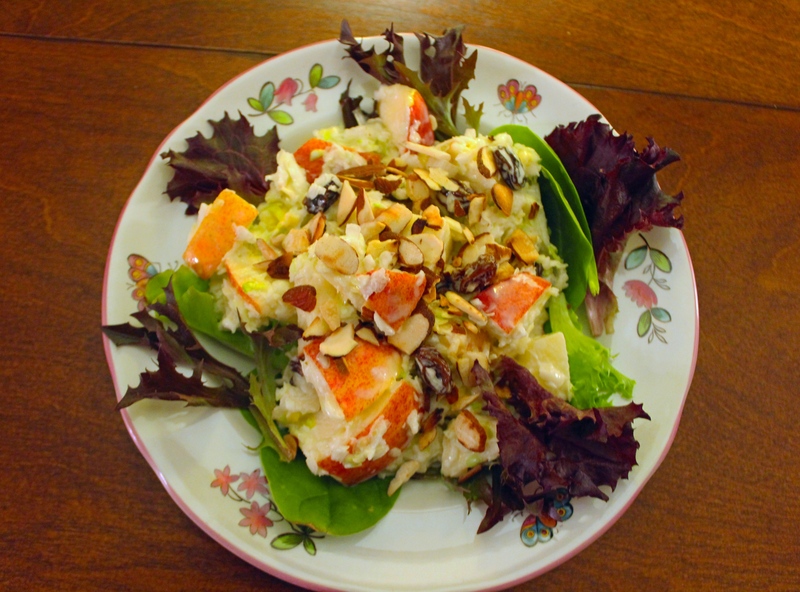 This sweet and tangy salad that he adapted from a recipe his mother served, had the flavor of my favorite Waldorf Salad. Combine the shredded cabbage, apples, onions, and raisins. Whisk the dressing until sugar dissolves and pour over the salad mixture. Toss and serve on a bed of spring greens. Top with the toasted sliced almonds. They say you should move to New Hampshire if you want to see all four seasons on the same day. I laughed when I heard this, but no more. This weekend brought a heat wave early in the day (55°), followed by the heavens opening with a deluge of rain, then thick fog billowing from the cold snow, twisting and blowing across the landscape like smoke. Snow began to disappear and chunks of frozen icebergs slid from rooftops… large enough to do great damage to any unfortunates who could have been beneath. Surprise! We awoke the next morning to sunshine and blue skies and less snow. We had to get outdoors! For our walk today, we chose the riverside path along the Squamscott River, a tidal river that empties into Great Bay, then the Piscataqua River, an inlet of the Atlantic. After the thaw and rain, what better time to check the ice on the river and just have an adventure after being snowbound and iced-in. 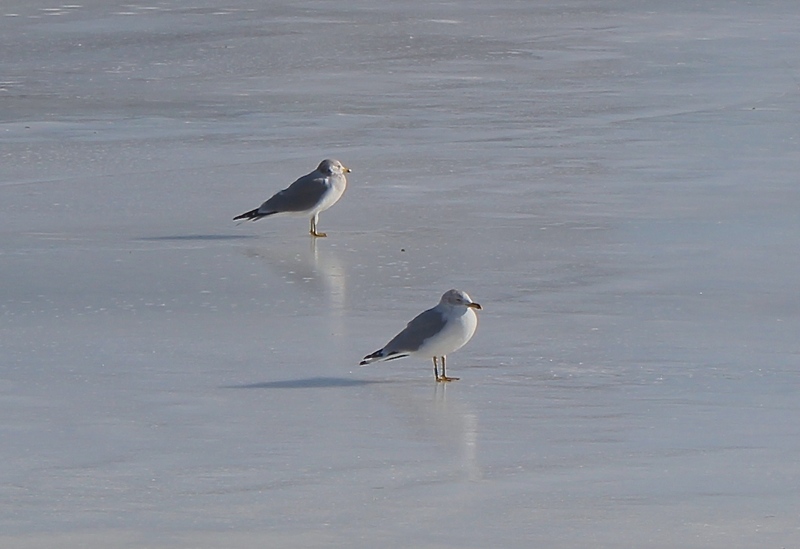 Seagulls were hanging out everywhere on the ice. I’ve always liked these birds. Yes, they can be pests but they are entertaining and simply do what they have to do to survive…. just like every living thing. 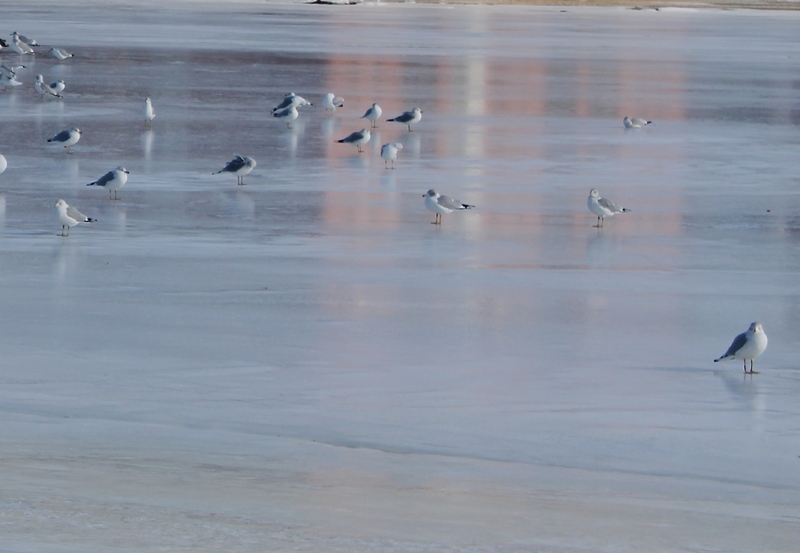 Brrrr… Stopping to observe the 50 or 60 birds dozing on the ice made my feet feel cold. 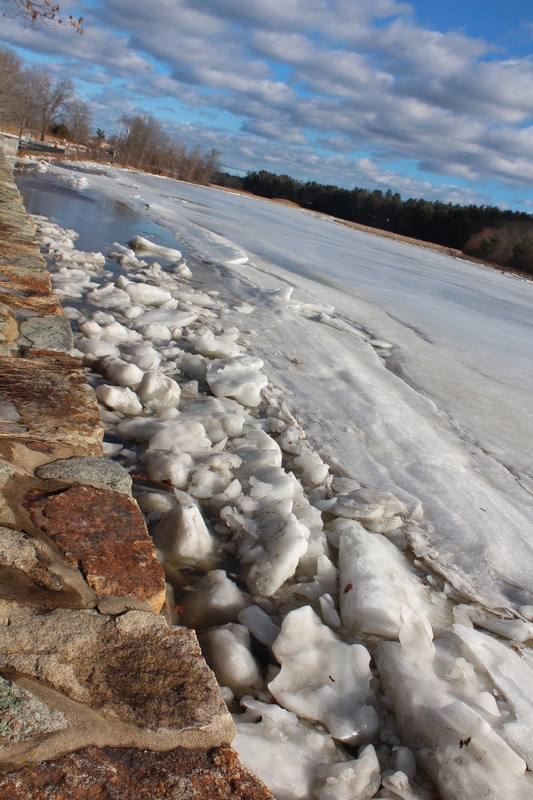 Along the edge of the river, the high temperatures, rain, and tidal action had done the job on the ice along both sides of the waterway. There will be no ice fishing on this river for awhile. We weren’t ready to go home after this short jaunt and decided to follow the river by car for a few miles to the tiny town of Newfields, a quaint village that we’d only driven through previously. 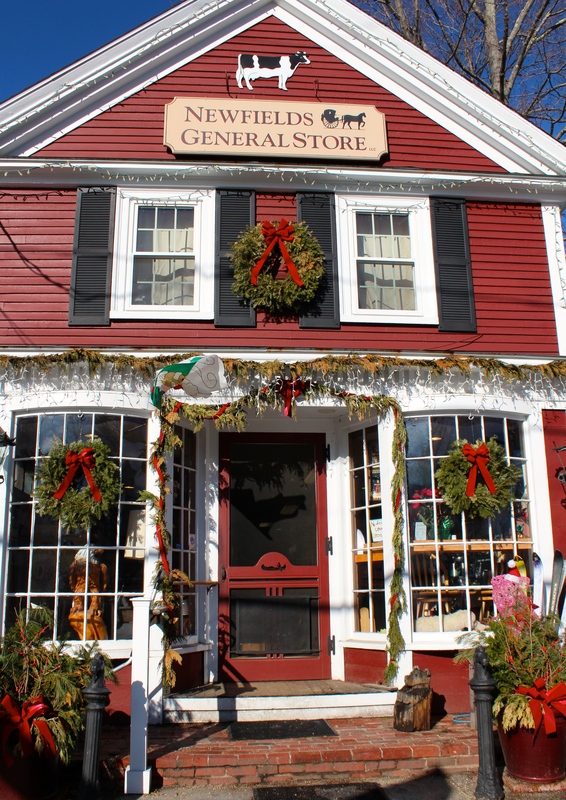 You couldn’t miss the country store in the middle of town and I hoped they were open on this Sunday…. and they were! 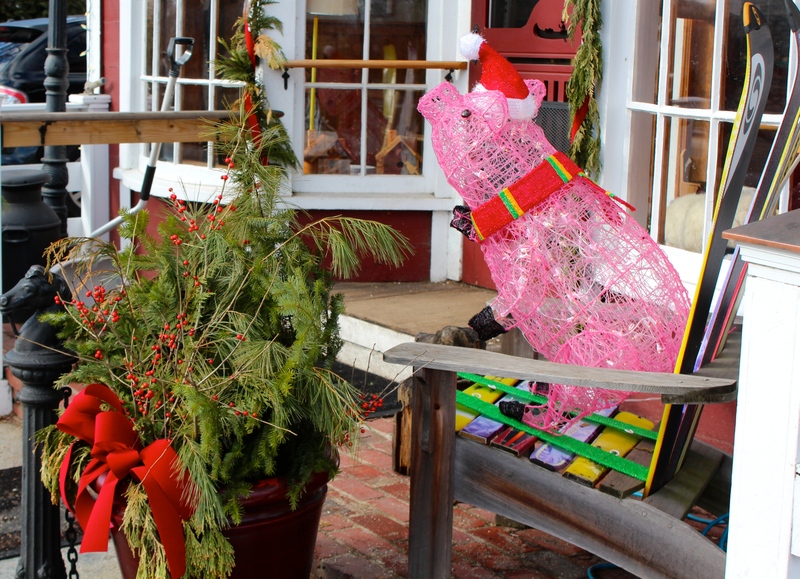 We were greeted by faded Christmas greens and a delightful Christmas pig sitting on an Adirondack chair made from recycled skiis. Stepping inside was like stepping back in time, a virtual museum of yesteryear. I had immediate flashbacks to our small country store in the Ware Neck area of Gloucester where I spent summers growing up and eventually bought a home as an adult. That country store, Nuttall’s, has not changed much in all those years… still the same grocery store/restaurant/post office… that now has wireless! 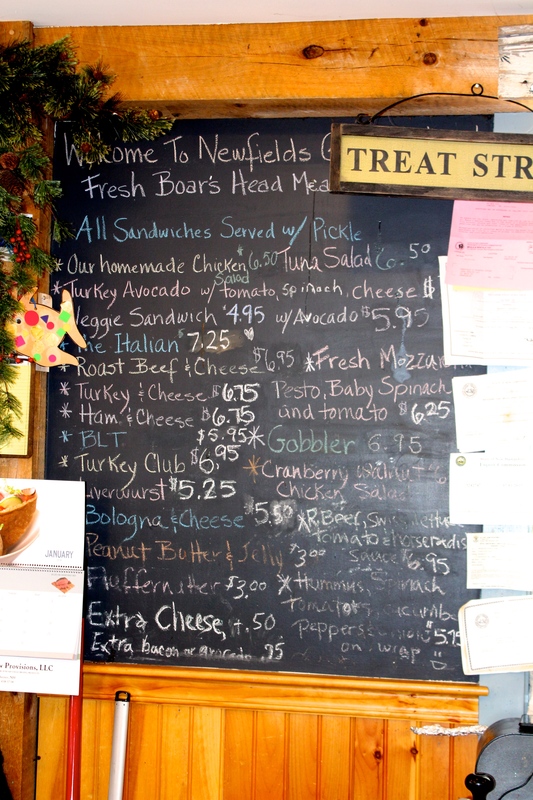 The aromas hit us as soon as we entered the Newfields store. 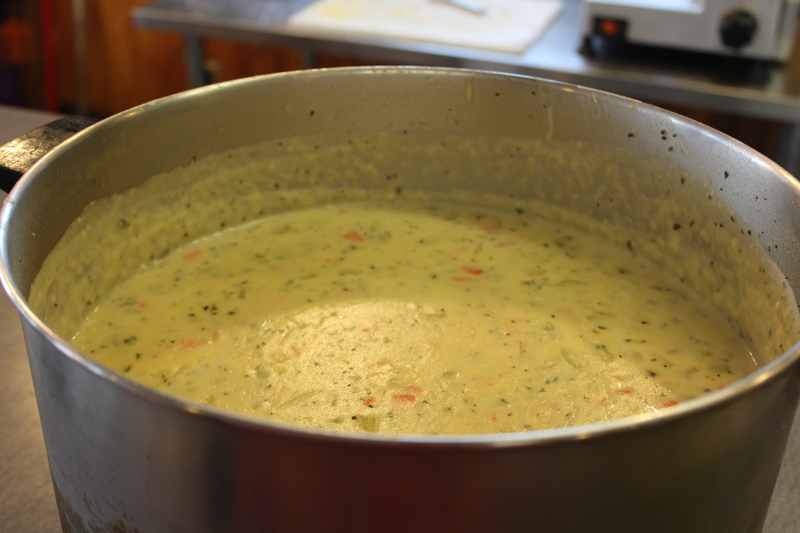 Freshly made soup was hot off the stove and the sandwich menu was immense. We each decided then and there to sit down and have a little lunch. mister gardener enjoyed a fabulous just-made potato chowder and I enjoyed my choice of curried chicken vegetable soup. A half sandwich for each of us completed our lunch. While we waited for our sandwiches, we poked around this slice of Americana. There was a miniature bakery in the back that produced inviting homemade breads and desserts. We browsed the shelves of candies, snacks and the well-stocked with drinks including wines, beer, ale and other spirits. Click for larger photos. A bit of Yankee ingenuity seems to greet us wherever we go around these parts. So many talented folks offer their crafts for sale and this store was no exception. 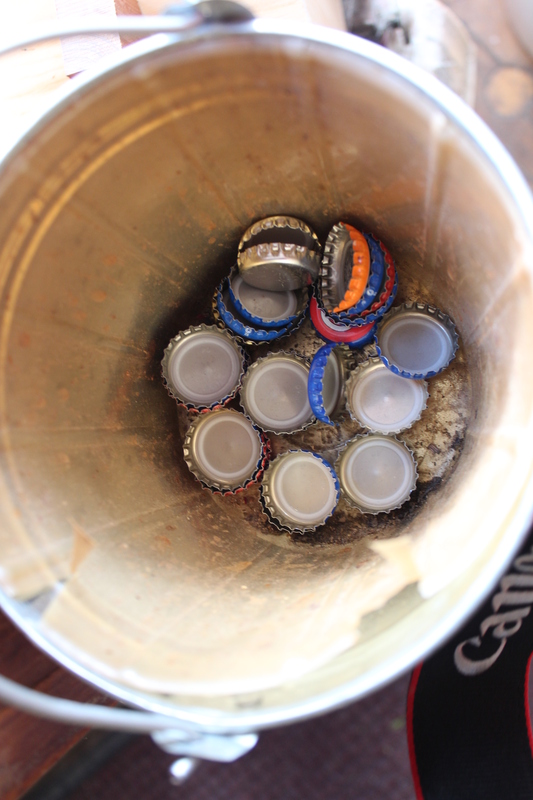 On our way out, we made sure we added our bottle caps to the bucket! A blizzard is on the way for New Hampshire tonight. 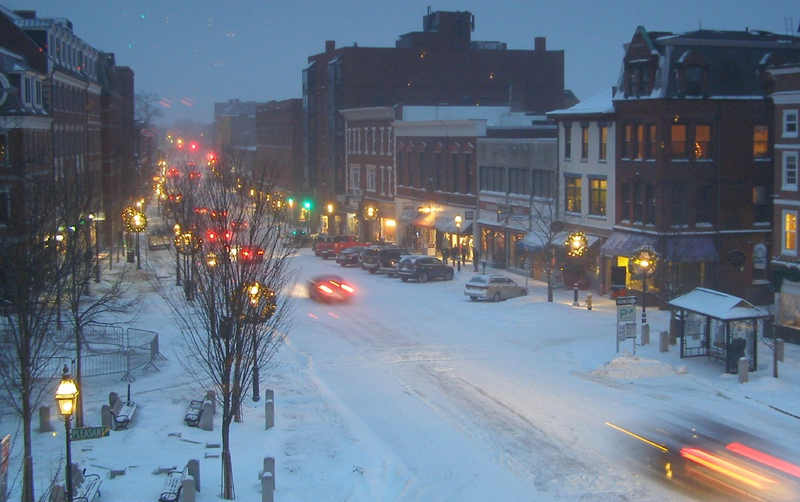 I always check the live webcam in Portsmouth NH to see updated conditions in the area. It’s a beautiful sight right now with traffic and street lights. Click on the photo to enlarge it and get the full appreciation of a snowy city with motorists hurrying home for the night. The camera snaps a photo every couple of minutes on Market Square. This scene was captured at 4:30 p.m., just minutes ago.